IMAGE: India’s Kidambi Srikanth. Photograph: Mike Blake/Reuters. 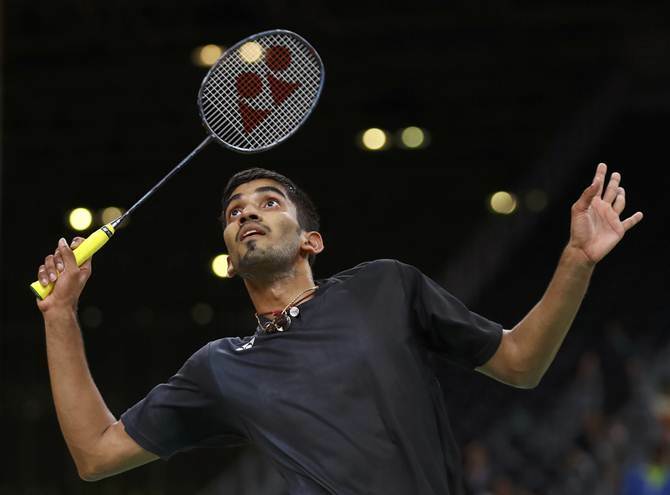 For the first time in the history of badminton, two Indians will clash in a Super Series final with Kidambi Srikanth taking on B Sai Praneeth at the Singapore Open on Sunday. Former World No 3 Srikanth, on Saturday, notched up a 21-13, 21-14 win over World No 26 and 2014 Youth Olympic Games bronze medallist Anthony Sinisuka Ginting to reach the third Super Series final of his career. Earlier, Praneeth, who had reached the finals at the Syed Modi Grand Prix Gold in January before being laid low by a shoulder injury, continued his rampaging run in the tournament to thrash three-time Korea Masters Grand Prix Gold winner Lee 21-6, 21-8 in a lop-sided semi-final match. Interestingly, Praneeth has a 4-1 head-to-head record against his more illustrious compatriot, who had clinched the 2014 China Super Series Premier and 2015 India Super Series and also reached the quarter-finals of Rio Olympics. After wrapping the opening game in 17 minutes, Srikanth continued to dominate the proceedings in the second as well. It seemed like one-way traffic with the Indian reaching 9-1 in no time. In women's singles, Olympic winner Carolina Marin also entered her third consecutive Super Series final within three weeks after defeating Sung Ji Hyun of Korea 21-9, 21-12. The Spaniard had lost her previous two finals – India Open and Malaysia Open -- at the hands of PV Sindhu and Tai Tzu Ying respectively. She would hope to cross the final hurdle when she faces TaI Tzu Ying again on Sunday.